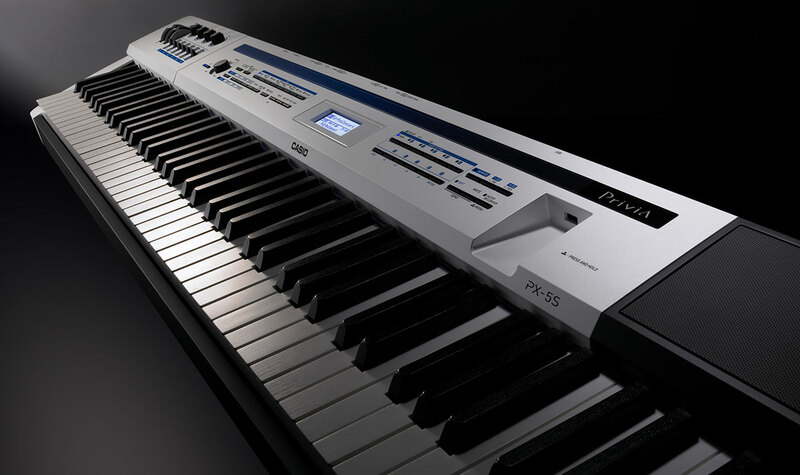 The PRIVIA Pro PX-5S is fully equipped to satisfy the requirements of both stage and studio: Featuring 370 AiR-quality tones, Hex Layer Sounds, Synthesizer Engine and four master keyboard zones. 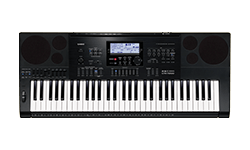 The CASIO PX-5S is a rich-sounding stage piano and a powerful master keyboard rolled into one that also boasts freely configurable rotary knobs and sliders, Arpeggiator and four-track Phrase Sequencer. Furthermore you can use the Data Editor software available for free download - an intuitive and practical tool which allows you to manipulate the parameters of PX-5S from your computer. Breaks a compressed chord or separate notes into certain patterns and repeats these. A short, continuous and repetitive series of notes is created. The audio recording function enables users to record in professional CD quality onto a USB storage medium or SD card (depending on the instrument). The recording can be burned onto CD or played back on every common medium. Input for connecting an audio source such as a CD or MP3 player, via a stereo (mini-headphone plug). The audio source will be audible through the instrument’s speakers, allowing you to play along. Instead of plugging it in, the instrument can be operated with the correct batteries. Digital effect used to double the timbre, making the sound more vibrant, broader and much livelier. This effect is used for digital piano or organ timbres in particular. The nuances generated by pressing the damper pedal are authentically replicated. Delay is an echo-like effect that gives the timbre more depth and three-dimensionality. As the name suggests, this function allows users to tune the instrument to another instrument, such as an out-of-tune piano. The specific feel of an acoustic piano also comes from the delay between striking the key and the sounding of the string. The size and mass of the hammer heads and the time that elapses until they hit the strings are directly linked to the pitch and striking intensity on the keyboard. CASIO Hammer Response technology reproduces this mechanical property of an acoustic instrument. 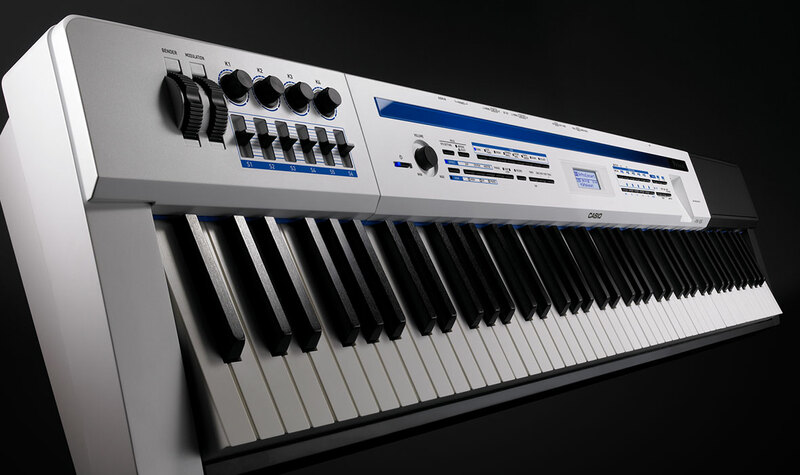 High Resolution Velocity is a new technology developed by CASIO and is approved by the MIDI Manufacturers Association. Instead of 127 steps, this technology provides 16,000 steps of the keyboard’s touch response, enabling musicians to reproduce every nuance of a grand piano’s dynamics. Key-Off Velocity measures the force of key release to produce specific tone decay for certain sounds. The lid simulator simulates the different sound characteristics (brighter/duller) when playing with an open or closed piano lid. There are four simulation levels to choose from depending on personal taste: open, removed, half open or closed. Input (L/R with standard sockets) to connect an audio source with line level (e.g. another instrument or sound card) to an instrument. Audio output on line level to connect the instrument to other professional devices, such as a PA or mixer console. Input and output socket for conventional 5-pin MIDI plugs for connecting MIDI-compatible devices to each other. Wheel (seamless) used to spontaneously apply a certain effect, such as vibrato, to a sound. This setting shifts the octaves on the keyboard to the more comfortable middle zone when playing pieces of music that require users to play on the very low or high zones of the keyboard. A sequencer used to record short riffs, melody lines or chord progressions and afterwards play them back with a simple mouse click. Thanks to the option of overdubbing, even complex and polyphonic ideas can be realised and easily reproduced as well as being transposed. A wheel that is used for spontaneous and creative pitch modulation to play other timbres, such as wind and string instruments, more realistically. Digital effect that adds reverberation to the timbre. 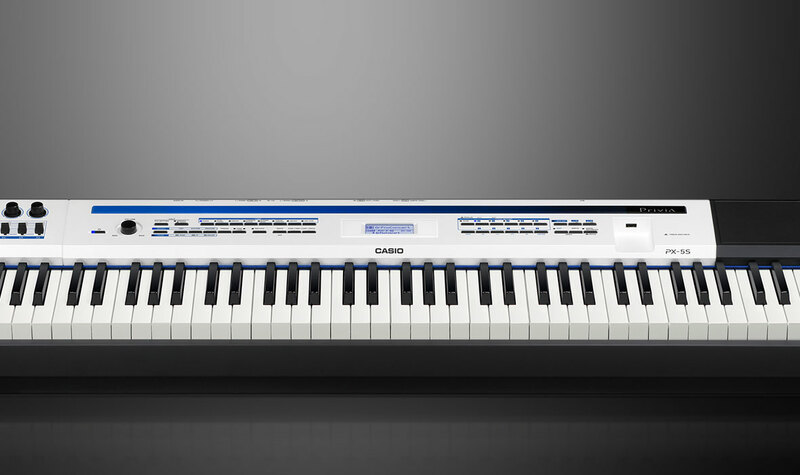 The unique CASIO string resonance system precisely simulates the resonating and interacting piano strings for all 88 keys. The nuances generated by pressing the damper pedal ("damper resonance") are authentically replicated. Tuning based on different scales allows users to play other sequences of semitones and whole tones, which enables them to play in different modes, such as old ecclesiastical modes. 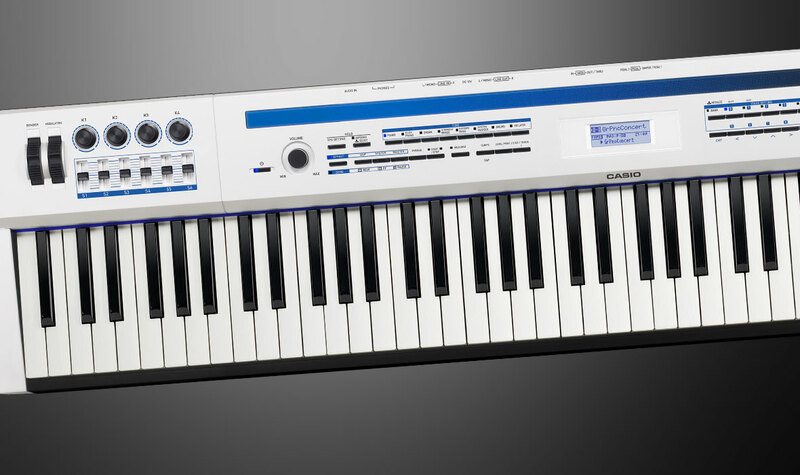 The II in Scaled Hammer Action II stands for an improved keyboard developed by CASIO. "Hammer action" means that the digital piano keyboard is weighted with small hammers to provide realistic touch sensitivity, just like that of a real grand piano. "Scaled" means that the weight of the keys decreases from the low to the high keys, just like on an acoustic instrument. 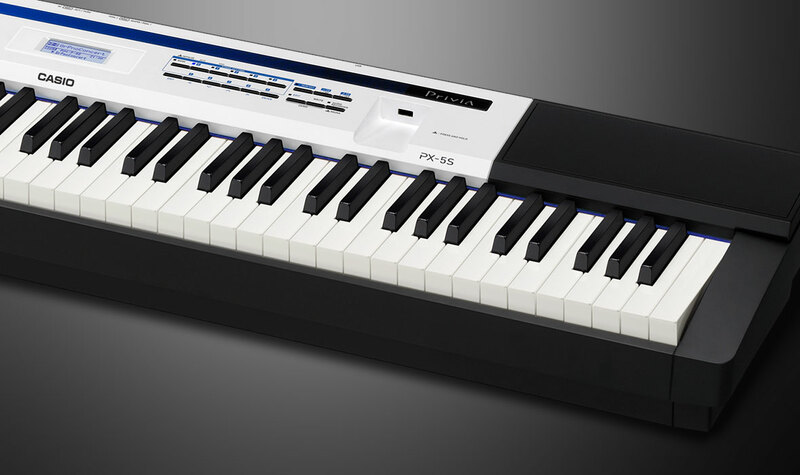 In addition to the classic tones, the PX-5S contains a powerful Synthesizer Engine that was developed from the XW-P1. This Synthesizer Engine provides a range of options for manipulating sounds using filters, LFOs and envelopes. The elegant keyboard design provides the same luxurious feel and look as genuine ebony and ivory. The carefully roughened surface texture prevents fingers from slipping, even after playing for a long time. The transpose function shifts the scale on the keyboard by semitones, for instance so that an F would be played on the C key. 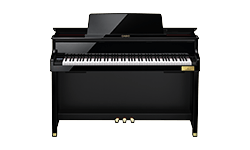 The new CASIO keyboard mechanism features three sensors per key; these sensors detect the intensity with which the key is struck to reproduce the response of a grand piano. This precise measurement also allows extremely sophisticated playing techniques at a high repetition speed. Port for a USB cable to connect the instrument to a PC or Mac for the purpose of MIDI and/or data transfer. Port used to connect standard USB storage media to your instrument to transfer data to/from your instrument. Availability of models and/or line-ups may differ depending on the country or region. Technical amendments and errors excepted.